A U.S. government mission to test in-space satellite servicing was struck by a major computer problem Friday, separating the mission's two spacecraft by up to three miles and challenging engineers to complete an automated long-range rendezvous long before planned. Orbital Express, an innovative program involving two spacecraft, was launched in March to conduct a three-month mission. The project includes ASTRO, a cutting edge servicer built by Boeing Phantom Works, and NextSat, which operates in a dual role as both a fuel depot and a mock client spacecraft. The Defense Advanced Research Projects Agency, or DARPA, is in charge of the $300 million mission. The two craft were attempting to fly in formation approximately 100 feet apart in a test Friday evening, but the delicate maneuver was cut short while ASTRO and NextSat were separated by about 30 feet. ASTRO suffered a serious anomaly with its sensor flight computer, triggering an automatic abort due to the loss of critical navigation and guidance data, according to Jan Walker, DARPA spokesperson. The computer, called AC-2, collects and processes data from ASTRO's suite of rendezvous instruments, which include visible and infrared sensors and a laser rangefinder. The information is then used by the satellite's navigation system. Walker said contingency abort plans called for ASTRO to fly to a point approximately 400 feet from NextSat. "ASTRO's fault protection software is programmed to, above all else, avoid a collision with NextSat," Walker told Spaceflight Now. As the ground team began responding to the problem, ASTRO's control software was switched to free drift mode, and the two satellites coasted apart to a distance of several kilometers, Walker said. Both spacecraft are now estimated to be up to five kilometers, or about three miles, apart, according to Ted Molczan, an experienced amateur satellite observer. Molczan spent three nights tracking the two satellites as they passed over his Toronto home. On Saturday, the pair was separated by about a mile, while the distance opened to about three miles Sunday and Monday nights, he said. 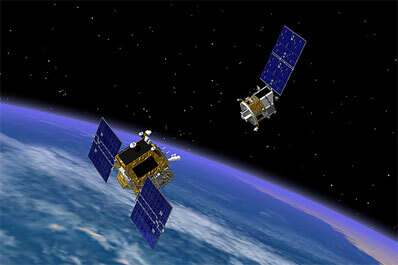 "The distances are not that great, and the two satellites remain in roughly equivalent orbits," Walker said. Officials say the AC-2 computer experienced a main processor failure, and attempts to reboot it have been unsuccessful. Walker said failures such as this can sometimes be attributed to anomalies known as "single event latchups" caused by high-energy radiation, but engineers have not yet identified a root cause. "The Orbital Express team has spent the past several days recovering from this fault and from problems associated with (the) loss of relative navigation (data) at the longer-than-anticipated separation distances for this scenario," said an update posted on the DARPA Web site. Officials continue to investigate the problem, and the team is now planning an attempted recovery, Walker said. "Both vehicles are safe," she said. "ASTRO powered up its redundant sensor flight computer and is processing sensor data nominally." The backup computer, called AC-3, is one of the mission's Orbital Replacement Units, or ORU's. The computer and a reserve battery were included in the mission to demonstrate the replacement of critical spacecraft parts using ASTRO's robotic arm. The ORU's are fully functional, and they can serve as active components of the satellites if needed. The AC-1 computer aboard ASTRO is the craft's primary flight computer, which continues to perform well, Walker said. ASTRO and NextSat could be reunited in the next few days if everything goes well, according to Walker. Officials originally planned to methodically complete the mission's objectives through a series of scenarios dubbed a "crawl-walk-run" by senior managers, but controllers are now forced to forego those plans to save the mission. Friday's activities were part of Scenario 3, which was to include backing ASTRO about 100 feet away from NextSat. Further tests were to separate ASTRO and NextSat by about 200 feet, conduct circumnavigations, and eventually perform a long-range rendezvous from a distance of seven kilometers, or about 4.3 miles. Orbital Express already completed a series of refueling tests using both pump- and pressure-fed techniques between the two spacecraft. ASTRO also flexed its Canadian-built robotic arm last month to transfer the battery ORU between the satellites.